I know I’m a few days early but thought I’d post this photo and description so everyone can learn, attend spin-ins and prepare for this fun day. Let me tell you a little about it….. 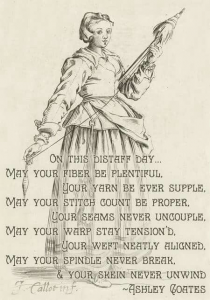 According to old English tradition St. Distaff Day was the 1st day after the 12 days of Christmas and the 1st Monday after the feast of Epiphany. This marked the day women resumed their household chores which included spinning! But, this day wasn’t all about work. Mischievous young men would try to set fire to their flax or wool and in return, the ladies would retaliate by dousing pails of water on their heads! In other words, it was a day for practical jokes & family fun. So, all my fellow spinners….enjoy your day, spin till your hearts content but remember to keep a pail of water close by! !